Is your pet a senior? That’s okay if they are because we celebrate seniors! 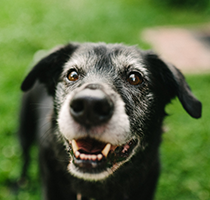 You may be surprised, but if your pet is between the ages of 5-7 years or older they are considered a senior. What does this mean? It means it’s time to keep a watchful eye on their health and we would like to help you do so. There are several factors that play into how fast your pet ages, such as breed, nutrition, exercise, environment, and climate. Small to medium breed dogs have a longer lifespan than large and giant breeds. Some common health issues associated with aging include: reduction in hearing and vision, dental disease, kidney disease, cancer, hyperthyroidism (most common in cats) or hypothyroidism (most common in dogs), difficulty keeping warm due to weight loss and weak immune system, which means they are more likely to get infections and have more difficulty recovering from infections. What can you as their owner do? To start, we would like to do a thorough physical exam on your pet to evaluate their current external health and a wellness blood test, which will evaluate their internal health. Even though your pet may not be showing signs of illness, the lab work is used to assess organ function and evaluate blood cell counts. In approximately 10%-50% of the asymptomatic pets who have labwork done an abnormality is detected. In many cases, we can treat these abnormalities and prevent them from becoming worse, and by doing lab work while your pet is healthy, it gives us a baseline for referring to should your pet become ill. The intention of this new program is to prevent illnesses prior to them becoming serious or untreatable. We want to maintain your pet’s good health and give you, their guardian, the power to do the same. For more information, or to make an appointment, give us a call at 510-662-1165.